A flower shop owner named Joe desperately needed a way to support his family when the economy hurt his business. In seeking for answers, he was inspired to mix up a homebrew tanning lotion. When friends and neighbors tried it, they came back for more. Soon Maui Babe spread through the Hawaiian Islands and across the world. Maui Babe has a simple product lineup, but they have a lot of die-hard fans. Let’s take a look at what they offer. Browning Lotion is the classic outdoor tanning accelerator. Browning Lotion, Tanning Salon Formula is the indoor tanning formula without mineral oil so it’s non-damaging to tanning beds. After Browning Lotion is exactly what you need to refresh and hydrate your skin after catching rays. Sunscreen, SPF 30 is a broad-spectrum sunblock for up to 80 minutes in water. Lip Balm, SPF 30 protects your lips from sunburn and heals them if they’re chapped. Moisturizing Hand and Body Lotion is perfect when you want to enjoy soft skin year-round. Coffee Scrub will help you prepare for tanning by exfoliating and renewing your skin. Body Butter soothes and heals dry, cracked skin. Variety Pack with Browning, After Browning, and Sunscreen Lotions is the best way to get ready for your upcoming vacation. The Browning Lotion is the original Maui Babe product based on Joe’s inspired formula. It’s not a self-tanner or bronzer, but it does contain Kona Coffee Extract and iodine which darken your skin temporarily. It’s perfect for laying out on the beach or by the pool. If you prefer to tan indoors, check out the Tanning Salon Formula below. The rest of the formula is a mixture of a little mineral oil, aloe, Kukui Nut oil, Vitamins A, C, and E, and potassium iodide. The result is a tanning accelerator that actually works while it softens your skin. 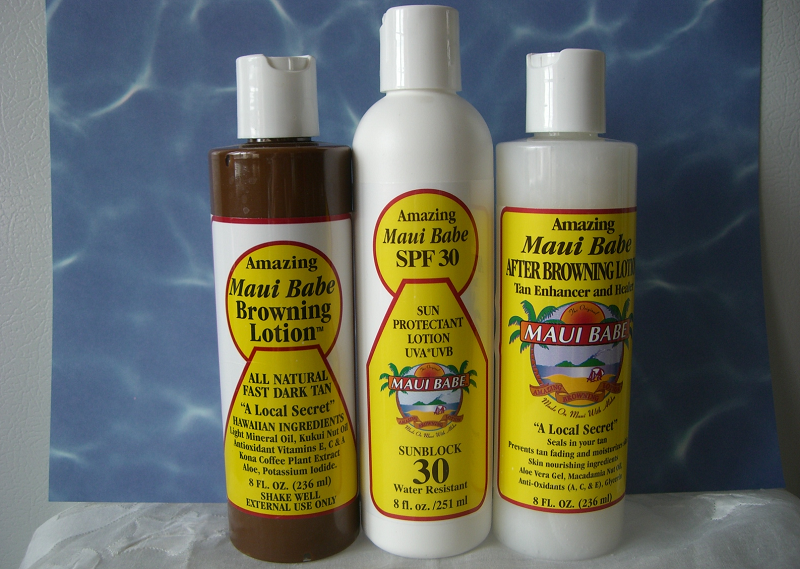 If you have light-colored skin, Maui Babe recommends applying the Browning Lotion over the top of their sunscreen to keep yourself from burning. Kukui Nut oil is a Hawaiian remedy for sunburns, while mineral oil is often used by sunbathers to deepen their tan. Aloe softens skin and protects against burning. Users say it feels a bit greasy and may mark your towel, but it washes off skin and out of clothes with no problems. Customers say they are delighted with the speed at which they tan while using the Browning Lotion. Maui Babe challenges users to test their product by applying the lotion, then placing a band-aid on their arm. Once they’ve exposed that arm to direct sunlight for 15 minutes, they can remove the band-aid and see the contrast for themselves. One last thing that’s nice about the Browning Lotion—it has a shelf life of 5 years. That’s great news if you don’t want to have to buy a new bottle every summer. The difference between the Tanning Salon Formula and the Browning Lotion is mineral oil, or lack thereof. The Tanning Salon Formula doesn’t contain mineral oil so it’s safe to use when you tan in a bed. It won’t damage the acrylic bed liner. Instead, it’s based on sunflower and safflower oils. It will still get you tan in a hurry just like the original Browning Lotion. After you’ve enjoyed the sunshine, use the After Browning Lotion to keep your tan from fading. Users say it keeps them from peeling and reduces suffering from sunburn. It’s a moisturizer that nourishes your skin with macadamia nut oil and aloe. Maui Babe says you can use it all year round as your body moisturizer if you like, or you can try the next product below. Another option for year-round hydration besides the After Browning Lotion is the Moisturizing Hand and Body Lotion. The formula seems to be similar to the After Browning Lotion. They are both based on purified Hawaiian water, aloe vera gel, macadamia nut oil, and glycerin, plus Vitamins A, C, and E. Users say this one smells a little different from the After Browning Lotion, but both leave their skin soft. Maui Babe’s SPF 30 Suncreen protects against both UVA and UVB rays for up to 80 minutes in the water or 2 hours on the beach. It’s lightweight and non-greasy, designed to be used underneath the Browning Lotion if you’re pale and want to tan without burning. It won’t slow down your tan at all, it simply protects your skin from UV damage. The active ingredients in the sunscreen are avobenzone, octisalate, octocrylene, and oxybenzone. It also has shea butter to keep your skin soft and hydrated. Maui Babe says to apply it 15 minutes before you go out into the sunshine, then reapply it when you towel off. Your lips can burn, too, so be sure to protect them with Maui Babe’s Lip Balm that has SPF 30 protection against the sun. It’s mango-flavored and made to soothe chapped lips with the power of shea butter and Vitamin E.
You could save money by purchasing the Maui Beach Pack with the Browning Lotion, the After Browning Lotion, and the Sunblock. This 3-in-1 kit has everything you need for a few days at the seaside. Did you know that exfoliating before you tan can help you develop a tan faster? It’s best to get rid of dead, dry skin so your tanning lotion and moisturizer work at full strength. The Coffee Scrub contains caffeine to increase blood circulation which also helps you tan. But the scrub isn’t just about exfoliating—it’s hydrating, too. It has a special blend of natural ingredients to renew and soften your skin. The formula contains ground Kona Coffee Beans, raw Hawaiian cane sugar, coconut, macadamia nut, sweet almond, avocado, and kukui nut oils, grapeseed essential oil, and aloe vera. While you’re in the shower, rub the Coffee Scrub in a circular motion, focusing on dry or rough areas like elbows or knees. Let it sit for five to ten minutes, then rinse it away with warm water. Follow up with the Browning Lotion if you plan to go tan, or smooth on the Moisturizing Lotion to seal hydration into your skin. The Body Butter sounds delicious, and it is. It has a tropical fragrance that will make you think you’ve gone on vacation once you massage it into your skin. It’s based on macadamia nut and coconut oil, plus cocoa butter and aloe vera. It’s thick, and a little goes a long way. Users say even though it’s creamy and rich, it sinks in quickly. It can help cracked heels recover and make chapped hands look like new. Maui Babe makes it easy to get the products you need for tanning and skin care without making you worry about which one is best. They have a straightforward selection of top-rated lotions that consistently get positive reviews because they produce visible results. It also doesn’t hurt that their scents are like a trip to the islands. If you're still not sure and want to see what other tanning lotions are out there, check out this article covering outdoor tanning lotions.